The SHIWA project, working with commercial research partner Correlation Systems in Israel, has worked together to optimise route calculations for seagoing commercial vessels. Correlation Systems specialises in geospatial data mining, self-learning algorithms and auto-prediction of future geospatial events. They are the developers of WWAIS, a maritime monitoring service that commercial vessels to be monitored using satellite-based AIS. It enables suspicious activity of vessels at sea to be identified – and their likely destinations to be predicted – so the relevant authorities can be informed when vessels arrive in territorial waters. WWAIS uses a complex processing model in order to map a vessel’s probable course. Firstly, general environmental constituents such as continental coastlines, islands and world port locations must be taken into consideration. Secondly, historical vessel data and worldwide shipping routes are added to the algorithm. 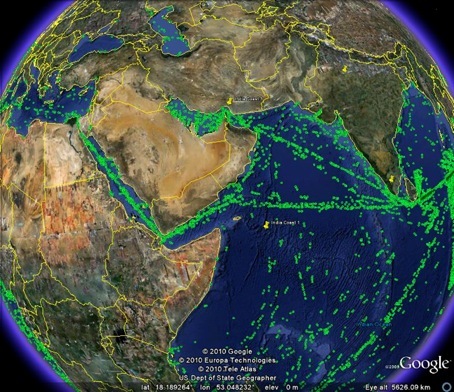 Correlation Systems currently calculates the data of about 200,000 unique sea vessels each day, every of which must be processed separately. Journey data gaps could span from several hours up to several days. The total number of actual events from these vessels can number up to five million events per week, so fully processing a single vessel’s voyages for a month can take up to two or three hours. The SHIWA Simulation Platform is capable of running scientific workflows created in different workflow systems, allowing users to capitalise on the advantages of each workflow language. For Correlation Systems this has translated into a saving on computation time, as the platform allows parallelisation of the route calculation problem, meaning that routes for several vessels can be calculated at the same time. When the point pair calculations are done, the application creates the shortest route for the ship by combining the results it has made and the historical routes from its database. WWAIS, in conjunction with SHIWA's Simulation Platform, enables more effective maritime law enforcement. Additionally WWAIS can aid in the study of world trade routes and financial activities such as oil shipping.